Entry will be free for all with plans for demonstrations, taster classes, falls prevention discussions, etc through the day as well as a number of guest demonstrations by teachers from other classes held at the hall – such as Yoga, Pilates, Taekwando, Tai Kick Boxing, – we are also expecting Alexander Technique and Massage to be available. 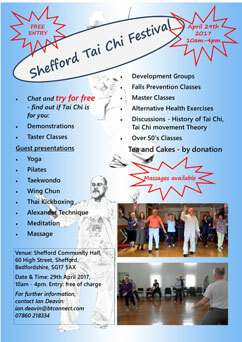 Share the post "Shefford Tai Chi Festival 2017"
Recent research has apparently demonstrated that creativity is enhanced by mundane activity – something the Zen meditators have long suggested. Too little activity and the mind stagnates, too much and the task overrides the creative process. 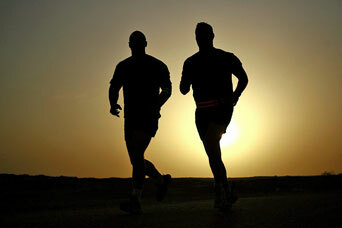 So, unsurprisingly, I get many ideas while jogging – so long as I am not too focused on competing with myself. It makes sense then that we practice our Tai Chi in such a way that it becomes mundane as this facilitates not only observation but also the creative thought process that enables us to learn for ourselves. An interesting simile is the idea of water – sometimes it is entirely appropriate to rush toward a goal with much left unconsidered, at other times it is good to just be still but too much rush or two much stillness results in disconnection or stagnation. Just the right amount of energy enables the water to flow gently into all the crevices without losing contact with the main body of the stream. Too much – we get disassociated eddies. Too little then no new connections can be made. Just the right flow and we can be connected and energetic – promoting creativity. Share the post "Positive daily work – chi kung"
One of my students has a long standing lower back condition which flared up recently to the point that his doctor thought he had slipped a disc – after a couple of weeks rest he came with a few others of the group to my teacher Karel Koskuba for a 3 hour seminar. Before we got started a couple of other students mentioned their own back problems – so we spent at least the first hour working on a very slow exercise for the back. 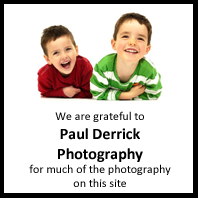 “The back is doing very well thank you. The Karel visit really did the trick, and motivated me to get back to my training, because I was very nervous about putting any strain on my back. The chat we had with Karel on standing triggered some thinking, as did the small slow movement over time. As a result I was standing on Tuesday morning, and about 15 minutes in I noticed a small horizontal muscle group in my lower back was tense, I relaxed it, no idea how, and immediately the hips dropped forward. The back straitened, sciatica disappeared completely, and the tension in my right knee went. I did 30 minutes standing and felt I could have carried on for another 30 minutes – totally relaxed. What I’ve noticed now is that my chest is tense, not relaxed and not connected to the rest of me and feels like it’s limiting my breathing – something else to work on next. Share the post "A good back for a long life!" 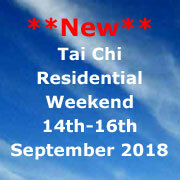 Our original Chen Style Tai Chi, weekly beginners/improvers drop-in classes will be moving to a new venue from the 11th March 2016 with a new time of 19.00-20.30. – so students will benefit from a longer class (1 1/2 hours), for the same price as previously (£7.00). 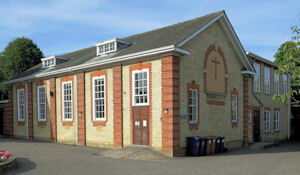 Venue: Tilehouse Street Baptist Church, Upper Tilehouse Street, Hitchin, Hertfordshire, SG5 2EE. Get directions and further information. Chen style Tai Chi Chuan or Taijiquan is valued for health, relaxation, personal development and martial arts. It is believed to be the original codified version of Tai Chi and is considered suitable for all ages. Chen-style focuses on softness with calm relaxed movement, balance, good posture and a quiet mind. Developing awareness of inner body feelings and of mental/emotional states is seen as an important aspect. Share the post "Change of venue for Tai Chi Beginner/Improvers classes in Hitchin"